You know those white polishes with the different color glitter in it that looks like Funfetti cake? I've always loved polishes like that. They are really cute polishes. The only problem is I do not like that the base it white. I think for most people this fine, but for me white is so stark against my skin it ends up making my hands look really red. When I saw LEX Cosmetics post a bottle shot of their newest polish Tuilleries I knew this is exactly what I was looking for. Tuilleries is soft milky pink jelly with small dark pink and larger red,silver, orange, and purple hex glitters. This is spot on! I love the base color of this, it isn't a stark white. The soft pink is really a nice combination with the glitter. This polish is so girly and sweet. I love how the glitter from the previous coats peek through the jelly base. The formula on this is great too. This was opaque in 3 coats. This is not streaky or uneven at all. I'm very happy with this polish, and it could be contender for one of my favorites so far in 2012! This polish also has a great story. This polish idea was created by Amanda from The Nail Polish Enthusiast. If you're familiar with LEX Cosmetics all of their polishes have a "Color Story". This is Amanda's Tuilleries color story..
"First, tulips are one of the first signs that spring is really, truly, finally here! Second, they always remind me of my mother..... I would love to have a color that can represent her in every way: in beauty, in color, in her favorite things, and in her uniqueness. My color would be light pinkish-red with glass-like flecks of silver, red, pink, and orange within it to showcase the depth of both tulips and my mother." This is a beautiful polish with a beautiful story. I know how meaningful this is for Amanda. $1 of each purchase of Tuilleries will be donated to lung cancer research. I ordered Tuilleries on LEX Cosmetics website for $10.00. Yummi, a truly "delicious" polish, and the cause makes it even more beautiful! This is definitely an interesting polish. It looks amazing on your nails!! I really love it! So cute! This is really adorable, and a great story! I love this polish! So pretty. This is such a beautiful polish!! I love this. Looks beautiful on your nails. I definitely need this one! Love this one, and love that it's for Amanda's mom. I think she would love it.. it's certainly one gorgeous polish! Very pretty! 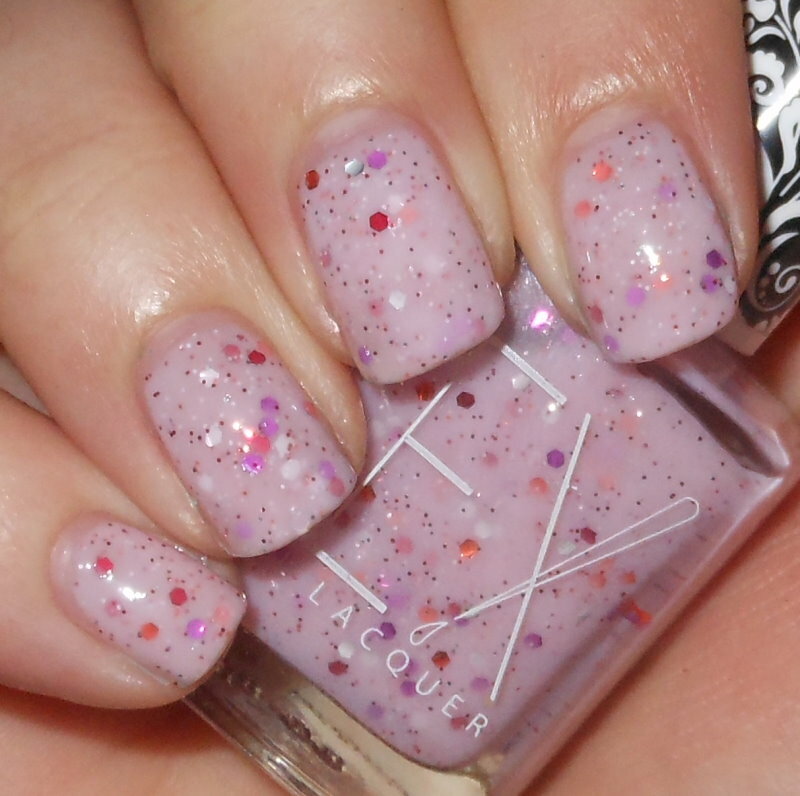 I just got Revlon Whimsical, which you may like as well - its similar to this, but with a light blue base instead of pink. I actually like the pink better, though! Ooooh, this is a nice take on all those pastel jellies with glitter. Very pretty. You're right, the base in this polish is perfect for your skin tone! Love it! It's nice to see that it is as gorgeous on the nails as it is in the bottle. This is definitely going on my wishlist. Wow! This is a great polish!! Definitely think this will be a must have for me! I love this polish! I agree, white looks awful with my skin but that pale pink is just gorgeous. Awww... I just ordered this and had no idea of the story behind it. So glad that the money will go to this cause. Looks great on you Stephanie! This is so beautiful! Great cause and story behind it, too. It's going on my wishlist! This is really unique looking. I love polishes that have multiple textures like this one. I've never heard of this company, so thanks for sharing!